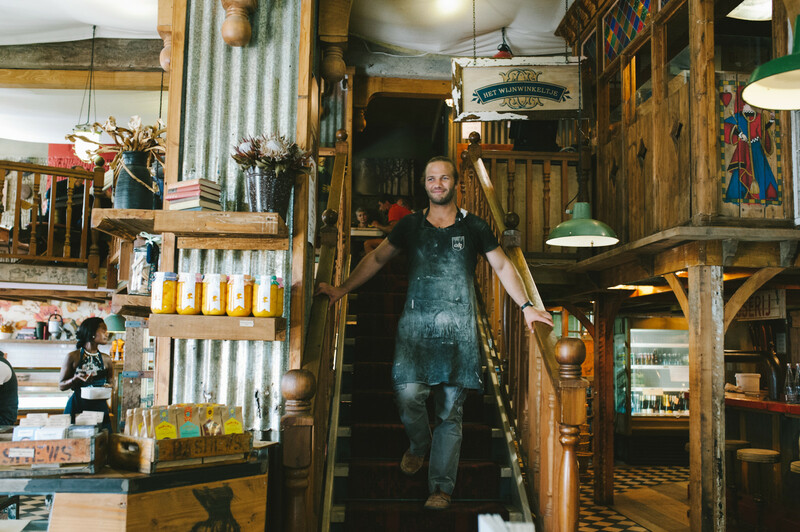 In the centre of Stellenbosch on Church Street, Fritz and Chanelle Schoon have created something extraordinary. 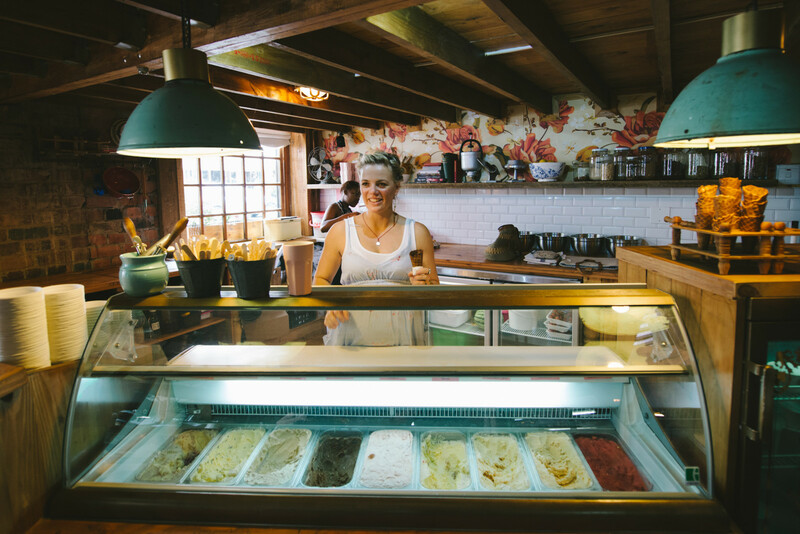 Their business, De Companje, is a bakery, a restaurant, a coffee roastery, a butcher, a produce store, a wine shop and an ice cream parlor in one – and that’s just the beginning. Fritz, what is good bread? Fritz: Good bread is something that comes from the land. You must ensure a high-quality grain – as a baker, this is something you must be very serious about. If you want to get a high-quality grain, you must develop a personal relationship with your miller, and then you start developing your product. From there on, it’s about attention. 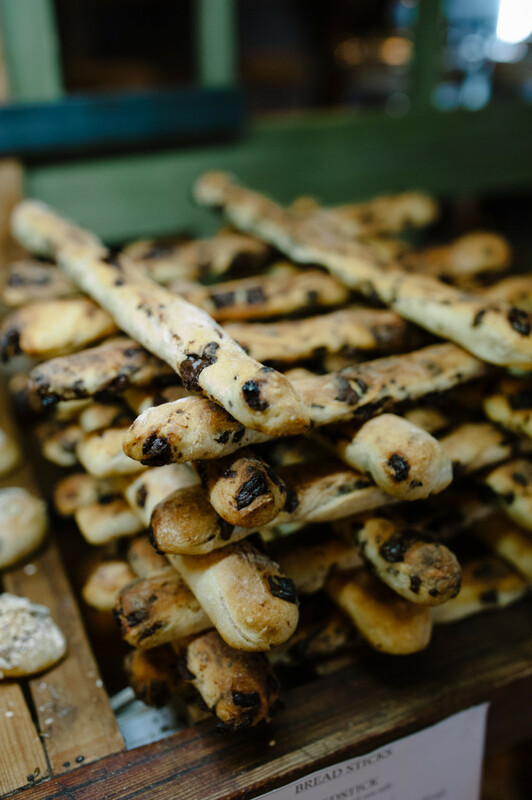 Every loaf, every batch of dough, the wood fired oven – you have to give these things attention. If you lose focus and stop caring, or if you compromise, then you blast it. You must be sharp. You must give a damn every day. This is what makes quality bread. How did this all start? How did you become interested in baking? Fritz: I was studying quantity surveying in Bloemfontein, and when I finished, I went back home to Johannesburg to work there. While I was working as a junior quantity surveyor, I realized that we had so many people on the building site who were traveling from so far – I said, “we must put up a little shop to supply them with food.” They didn’t allow me to do that on the site, but I still did my calculations. I thought, this idea could make some money. The motivation was twofold: to give the guys proper food and to start a small business on the side. I started studying baking and really trying to understand it. Eventually, I started supplying airlines with little mini rolls. When I got that contract, I decided to borrow half a million rand and put it into ovens. Thousands of orders were coming in by this time and I employed more people, but we couldn’t keep up. So I built a big freezer room. When orders were placed, I just took everything out and defrosted it. We started getting complaints. It was very embarrassing and I had to close the bakery. Everything at De Companje started initially with the bakery, which is called Oude Bank Bakkerij. How did that start? Fritz: I learned the trade for two years and decided I wanted to come live in Stellenbosch. I found this little spot here in the back by chance. I got it for a very cheap price. I built the oven, and I knew I could bake enough bread to pay rent very easily, and that was the concept: to bake bread and to sell it in slices. How did you meet Chanelle? Fritz: Because I didn’t have any money when I moved here, the landlord allowed me to stay upstairs in the storeroom. So I built a shower and I lived up there. After a year, I could afford to live in a flat, so I moved out and was staying there for a couple of months, but it was too fancy for me – I wanted to move back to the storeroom. Chanelle had just returned from overseas and was looking for a place because she needed to help a friend who had a pastry shop across the street, and she came to look at my flat. I was blown away. I knew she was not in my league. There was no hope in my heart. When were you ready to open De Companje? Chanelle: From the first day of building to opening day was exactly nine months. We opened August 1, 2013. Tell us about some of the individual components of the market – Het Wijnwinkeltje, for instance, which is the wine shop. What happens there? Fritz: We have flights that we serve at the wine shop, but we also have a wine of the month club. We send you a box of wine every month or two months or four months, or however often you want it. And every month we have a food and wine pairing where we go to the winemakers farm. The butcher shop, Nice To Meat You, is known for its tasty braai (or “barbecue”) nights. Fritz: The butcher shop was just breaking even – making ends meet, but not doing very well. The margins are very slim and if you’re renting space in this place and trying to compete with other butchers around, it really is impossible. But the butcher shop can’t run at a loss. So I told them they must think of a plan to get the meat on a plate. They decided to start the braai evenings where there’s an open fire on the streets. It’s been really successful. Chanelle, tell us about Fanny Chanel, your ice cream shop. Chanelle: All the ice cream I make myself with pasteurized farm eggs, and I use cream from the university’s dairy farm. There is nothing artificial and it is all natural and seasonal. I also make my own cones. No other ice cream shop in South Africa makes their own cones and mine are very unique. They remind me of stroopwafels. We do milkshakes, too, and I want to do waffles in the future – but everything step-by-step. Where did the name De Companje come from? Fritz: “Schoon de Companje” is what we call the collaboration of everybody together, because it’s mostly family: me and my wife, my sister and her husband. My mom designed the interior. To use this type of retail space for production is actually insane – it’s a hell of an expense. But that was the point. The point was to showcase how stuff gets made. It’s not just a deli. We show how the meat is worked; how the ice-cream is churned; how the coffee is roasted. When you have time off, where do you go? Fritz: We focus on taking one overseas holiday for two or maybe two-and-a-half weeks a year. It’s amazing what it does to you – you come back with so much creative energy. You lose that when you’re just in the same space all the time. We were in America for a grain conference in August and the two of us went to San Francisco afterwards just to check out food places. It was absolutely amazing. I haven’t ever seen a place like yours – did anywhere from overseas inspire you, or was it all made up for Stellenbosch? Fritz: I think this is something I learned from my mother, which is quite amazing: she never copies. She believes in authenticity. The spoons, cups and saucers she designed, we now see them in magazines. And that’s cool, because the pioneer always stays in front. You can copy as much as you want to, but really, there is no depth to it, no longevity in it. Chanelle: Fritz and I have big visions. But for the time being, we don’t want to lose focus. 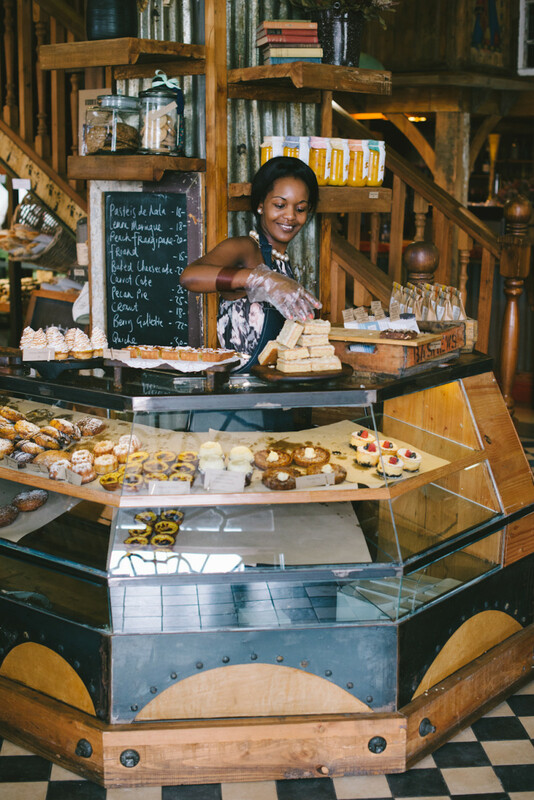 Tell me about this neighborhood – let’s call it the downtown of Stellenbosch. Fritz: The fact that it’s old is awesome. It’s rich in history, which I love. Also, the people here are like-minded. They are culturally aware, well-traveled; they are aware of food and fine wines. They like spending time with people. They work hard, but they also don’t take their lifestyle for granted. And this place offers so much: you’ve got the mountains, the sea, the vineyards. You’ve got ample restaurants. You’ve got good people. There’s always something to do. And at the same time, it feels like a small town. Fritz: We like to go to Overture – that’s one of our favorites. It’s Bertus’ restaurant, a friend of ours. Chanelle: Oh yeah, that’s for a nice supper. And I like to go to Hemelhuijs in Cape Town. Would you recommend working with your significant other? Chanelle: If a couple can work together, that’s the best thing. To work with family is so much nicer because they have your back – they always have your best interests in mind. Thank you, Fritz and Chanelle, for breaking bread with us and sharing your thoughts on diverse entrepreneurship. Find more information about Fritz and Chanelle’s De Companje on their website.